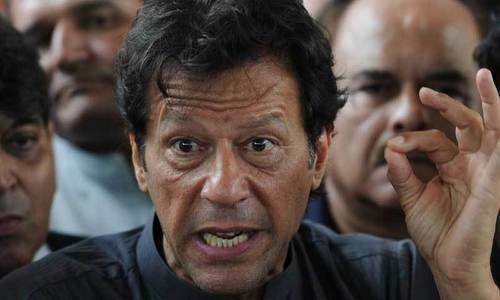 ISLAMABAD / KARACHI: Pakistan Tehreek-i-Insaf (PTI) chairman Imran Khan will formally launch his party’s election campaign at a public meeting in his native Mianwali city on Sunday (today). In a video message released by the party’s media department, Mr Khan appealed to the people of Mianwali to attend the rally at the Hockey Ground in a large number. In a related development, an election tribunal in Karachi dismissed an application challenging the candidature of Mr Khan from NA-243 (Karachi). Mr Khan is likely to contest the election from five constituencies of the Nat­ional Assembly in Punjab, Khyber Pakhtunkhwa and Sindh. The PTI leader in the video message said he had decided to launch his party’s election campaign from Mianwali because it were the people of this city who had helped him enter politics. He recalled that he had become a member of the National Assembly for the first time in 2002 after winning the election from Mianwali. Mr Khan said that today the PTI had become the country’s largest party and expressed the hope that it would form the government after the July 25 elections and would make a new Pakistan as dreamt by the Quaid-i-Azam and Allama Iqbal. The PTI chief had also won the NA seat from Mianwali in the 2013 elections, but he later vacated it and decided to retain the NA-56 Rawalpindi seat. A senior PTI leader, when contacted, said the party had not given the call to its leaders and workers to attend the Mianwali gathering and only the local leadership would be present there. He said all the other leaders of the party were busy campaigning in their respective constituencies. In fact, he said, the party had launched its full-fledged election campaign with the public meeting in Lahore in April. In Karachi, Abdul Wahab Baloch had filed the election appeal before the tribunal against the order of the returning officer (RO) to accept the nomination papers of the PTI chief. The tribunal headed by Justice Yousuf Ali Sayeed dismissed the appeal and upheld the order of the RO for reasons to be recorded later. The appellant had contended that there were different signatures of Mr Khan on his nomination papers and affidavit and that he had not mentioned the sponsors of his overseas tours. 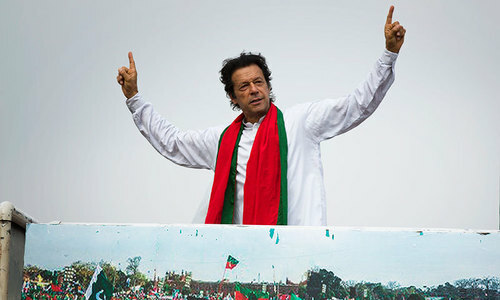 Mr Baloch, a candidate of the Justice and Democratic Party headed by former chief justice Iftikhar Mohammad Chaudhry, had alleged that there were many concealments and mis-declarations in the nomination papers of the PTI chief and that he had not disclosed the name of his daughter Tyrian Jade Khan-White. Mr Baloch had said that Mr Khan had also failed to mention who was financially supporting his two sons and that previously he had done nothing as a member of the National Assembly. The appellant had argued that the returning officer had not considered his objections while accepting nomination papers of the PTI chief. Its going to be fun month. 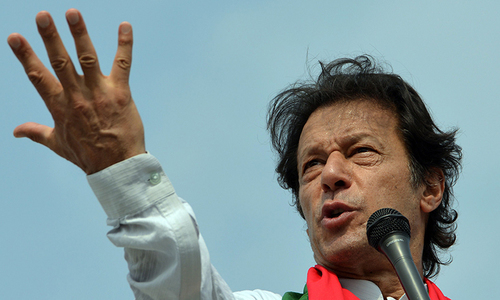 Hopefully, IK will leave the constituency after winning the said seat from Mianwali, like he did in 2013.